A new way to live out my Marilyn Monroe dreams!!! Or maybe not? I love Marilyn Monroe, but at times I also feel that she's the reason why no one can spell my whole name right hahahaha. 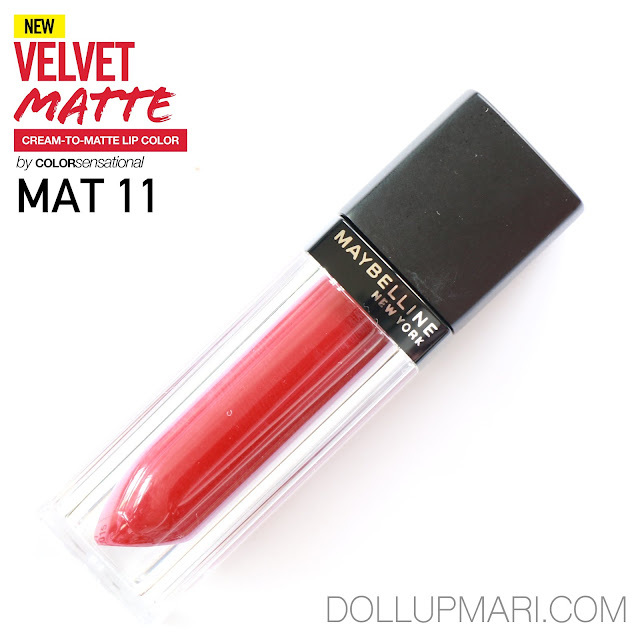 Nonetheless, Maybelline is unveiling the future of mattes with Maybelline Velvet Matte lip color! This is the shade of Mat 11, or their bluish shocking red. There are several reds in the roster of shades, but this one is the most vivid of all. And here it is! I really love the effort they put in to make these in acrylic packaging because it helps a whooole lot in identifying the shades. I really applaud all the companies who have been making an effort to make their lip products' shades easier to identify through the packaging alone. This is the shade of Mat 11. For the curious folks out there, here are the ingredients. 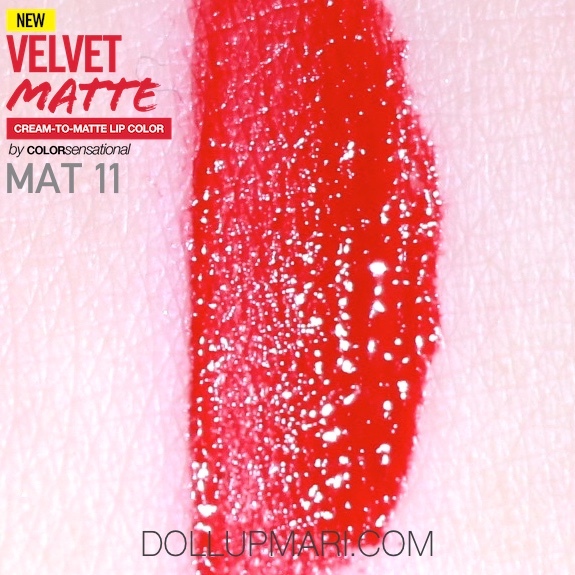 The catch, though, is that this listing is for all the shades of Velvet Matte. I initially marked and kept all the wrappers of the products thinking that each listing would have different ingredients depending on the shade, but when I started comparing, everything was the same. 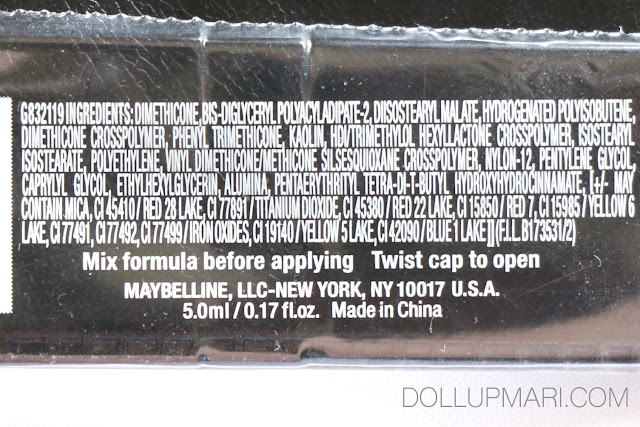 While pigment allergies are very rare, if you are allergic to any of the pigments listed, it seems like you'll never know from the ingredients alone whether the shade you're eyeing has it or not because it's a lump sum listing. I think, however, if you write to them, they will be sure to come back to you with proper information. One thing I like about this is that it comes with this nice doe foot applicator. While this means that one should avoid using this after eating (because the applicator might get contaminated), it's got a very good shape that is good for getting the product onto the contours and tiny crevices of the lips. I was kinda sad though that this is unscented! I know there are a lot of people rejoicing because they don't like the usual tutti frutti fragrances companies use on products like these, but I happen to be one of those people who loves the tutti frutti part of it hahaha... But well, at least, if you have problems with fragrance, this seems like a good option. So here is how it looks like on the lips. It's a shocking, vivid red with a blue undertone to it. This product is also amusing to me in the sense that it gets onto a lot of things, but doesn't get onto the teeth. 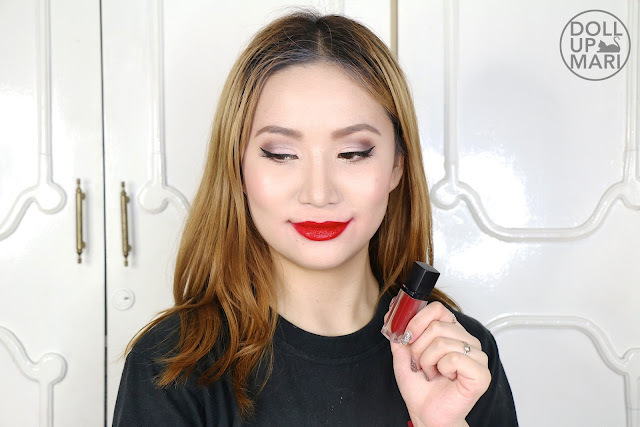 When I am wearing this product, it will really smudge onto anything that grazes on my lip. There are also marks of this on the cups I have drunk from and the various eating utensils I used. I behaves like a thick, pigmented lipstick. 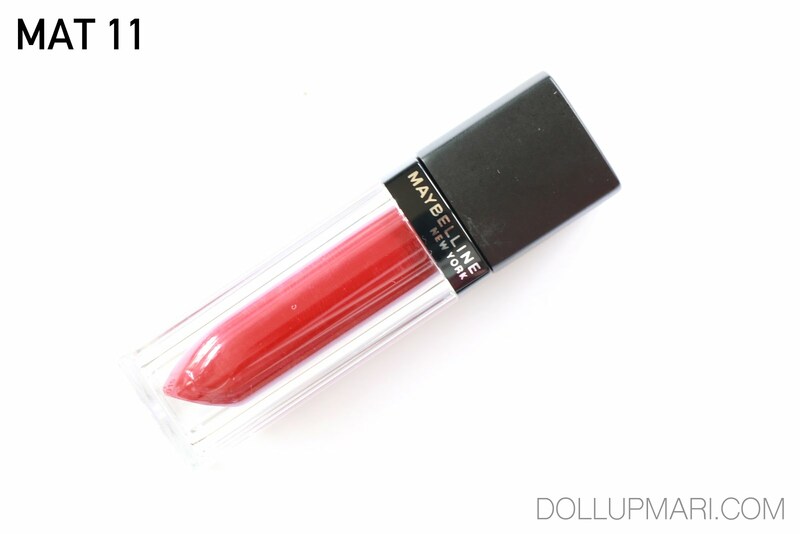 If you are very self conscious about lipstick stains on your stuff, be careful with this one. But at the same time, amusingly, it never gets onto the teeth. I still cannot understand or explain until now as to why this is happening. But at least, this will be a good choice for people who will not have mirror access for their endeavors (perhaps if you're going to host an event or something, this will be a good choice). When it comes to lasting power, this doesn't last very long on full blast. By full blast I mean as in the state wherein the pigmentation and color is still as strong as when it was first applied. Since it gets onto a lot of objects like cups and utensils, some of it gets removed as you go about your activities. But the tint that it left lasted for more than half a day though, which is good. I'm also thinking that if one will wear this and not eat or drink, it can probably last long enough. But when it comes to the color itself, it will actually take quite some time before someone needs a retouch because it's just so vivid. And, since it leaves a nice tint on the lips, which is why if you aren't necessarily channeling a look that involves shocking red lipstick, I feel like you can make do with the tint it will leave and go on about your day with it. If you're into crazy lasting power, you can still use this, but you'd prolly need to buy translucent powder to set it with or some other lip makeup setting product. But if you are after comfort in daily usage, by all means, buy this product and get all the shades. The last thing I want to say is that I'm happy with how easy it is to apply this. I've had a hard time with those liquid lipsticks that really dry up because it's so hard to fix smudges and misplaced product. 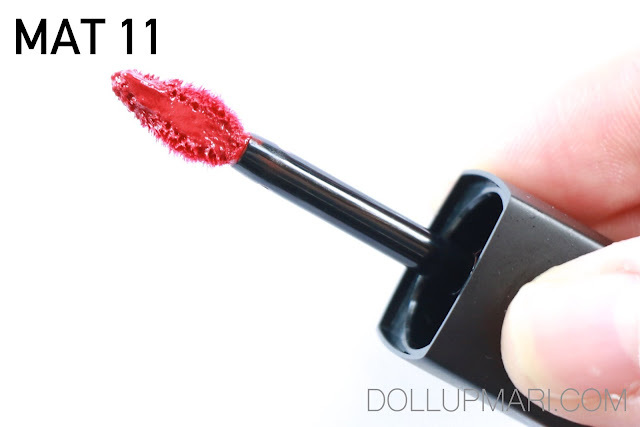 I like that since this is a really soft formulation, it's not hard to get rid of misplaced lipstick as it rubs off easily from the sides of the lips when wiped. It also doesn't leave a crazy stain on the side of the lips when wiped off, which is definitely another plus for me. 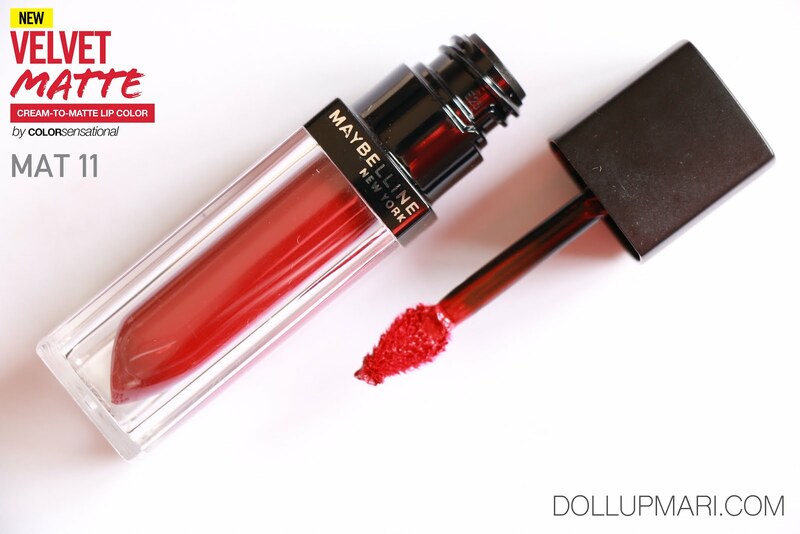 This can be bought from Maybelline counters nationwide for Php349 and at a discounted price of Php299 for a limited time only! Get yours today!